SME event-driven finance is fast becoming the natural terrain of the alternative finance industry. Before the financial crisis, banks dominated all areas of business lending. Alternative finance meant getting some money from your mum. But things have changed. Regulation over the past decade has forced banks to retrench. In the years immediately after the crisis, net lending to SMEs fell heavily into negative territory. Now, while banks have re-entered the market to a degree, they remain cautious around what their credit measures tell them are ‘riskier’ loans to businesses. Business default rates haven’t changed – other than is normal over the course of the cycle – but banks’ attitudes to risk have. Business owners complain that banks are reluctant to lend against anything apart from bricks and mortar. That seems to be more common of event-driven deals such as M&A, MBO, MBI, Bimbo and growth finance, because while such deals can be asset backed, cash flow or a mixture, in practice they are predominantly cash-flow based. The rapid growth of alternative finance providers over the last few years appears to support this. Alternative finance providers are filling the vacuum left by the banks. In 2016, the last full year for which data is available, about 72% (£3.3bn) of UK altfi lending was to start-ups and SMEs: up 50% on the previous year, as 33,000 businesses used alternative finance channels. While the term ‘altfi’ conjures a picture of high-tech hipsters running funky software platforms, the reality can be more down to earth. Firstly, alternative finance has significant structural advantages over conventional lenders when it comes to business lending. One of these simply stems from the fact that it’s new. That sounds a trivial point, but whilst most high street lenders have been around since the days when a computer was someone with an abacus, so has much of their existing business, and that determines what new business they write. Alternative lenders don’t have this legacy back book, so can focus on supporting a client in the here and now, not using new business to prop up their back book. Another advantage of newness is that you can configure business processes to specific and simpler requirements than that of a large banking organisation, which is of necessity complex. On the other hand, Kash Moghul, Business Originator at ThinCats, says: “We’re able to make a decision quickly. I work very closely with the regional head of credit. That has a lot of benefits.” Not least, speed of both decision and transaction. More importantly over the long term, however, is the bespoke service alternative lenders are able to offer businesses. In the first instance, this is about the basic structure of a loan. “Banks will typically offer a loan that fully amortised over three or four years,” says Moghul, “but the nature of a particular business may dictate interest only, or a bullet payment. Altfi has more freedom to tailor the loans to the specific needs of the business.” Again, this is linked to the understanding of risk. Formally, a fully-amortised loan will be lower risk, because the lender’s capital at risk will decline to zero over the loan’s lifetime. But the implications of servicing this for a corporate borrower transitioning to a different management structure may mean more risk for the firm, and so greater potential to default. If this sounds like traditional business banking to you, you would be right. The paradox is that it’s increasingly difficult for traditional banks to service, through a combination of restrictive regulations and how new lending is conditioned by legacy business. On the other hand, some alternative lenders are combining the skills of professionals who have had decades of experience working alongside SMEs with business models that are specifically designed to service this sector. Rather than the nippy little altfi mammals outcompeting the traditional banking dinosaurs, it’s likely some sort of equilibrium will be reached, with banks dealing with plain vanilla refinancing needs, with more of an emphasis on large caps, and altfi servicing event-driven and other non-standard loans. 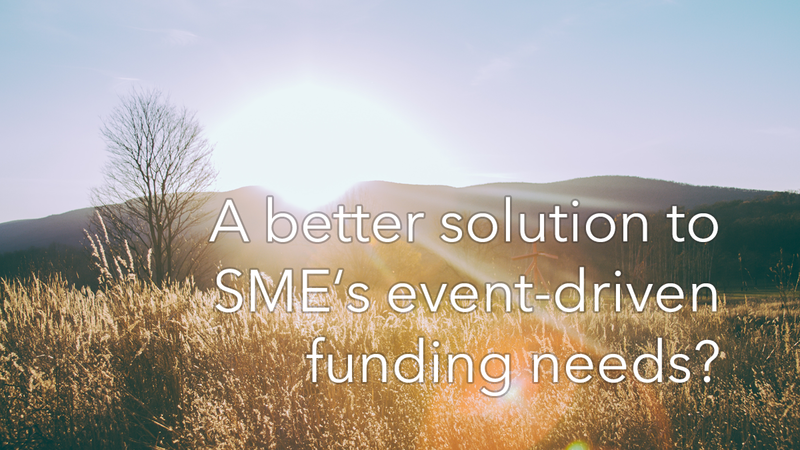 Event-driven SME finance will almost always need financing structured in a way that is unique to the business. That is where the benefits of alternative finance are clearest.